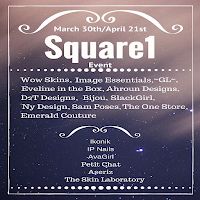 Square1 is back and even better than before. The sim has been remodeled and now has a mystic quality. The wonderful sales items are still here, but the atmosphere has changed from modern shopping mall to magical marketplace. There are places to relax and meet with friends and LOTs more room for creators to display their items. If you've been looking for a venue to display the wonders that you create, this might be just the place! 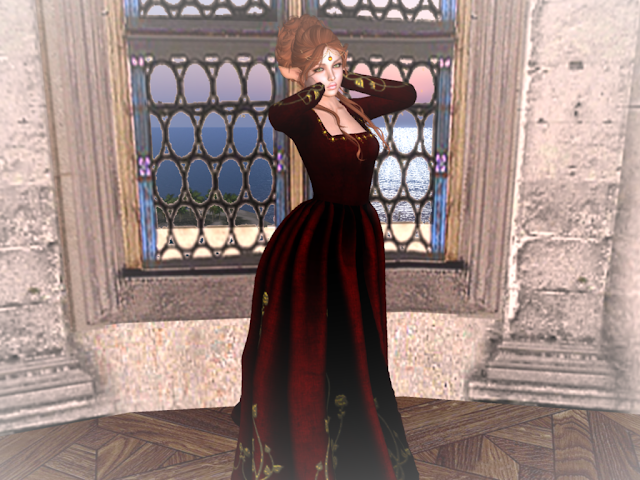 If you're looking for something magical to wear, may I recommend the Helena gown by EvelynintheBox? The textures on these are beautifully done and it is available in four color combinations. My nails are also available @ Square 1. Called Double Infinity from IP Nails, these are two colors with a silver infinity sign dividing the sections. Add shoes from KC, Truth Hair in a lilac that almost matches the dress and a necklace from Moondance Boutique and you're ready for the most formal affair or for dinner with your lover. We all have that temptation to be a little...naughty... at times and to try some things we wouldn't ordinarily do. Fortunately for me, this time it was a GOOD thing! This strap dress from Entice* looks wonderful contrasting against the flower covered Lillith Porter's Chair from Angelic Designs**. I finished the look with jewelry from Moondance Boutique*, shoes from Lindy* and nails from Koffin Nails**. The textures on all these items are amazing! The Porter Chair from Angelic Designs is available with 3 different flower canopy styles (Blush shown). Black skulls on the armrests can be turned on or off. Isn't it wonderful when items from different events just seem to be made for each other? My outfit represents items from three different fashion events. 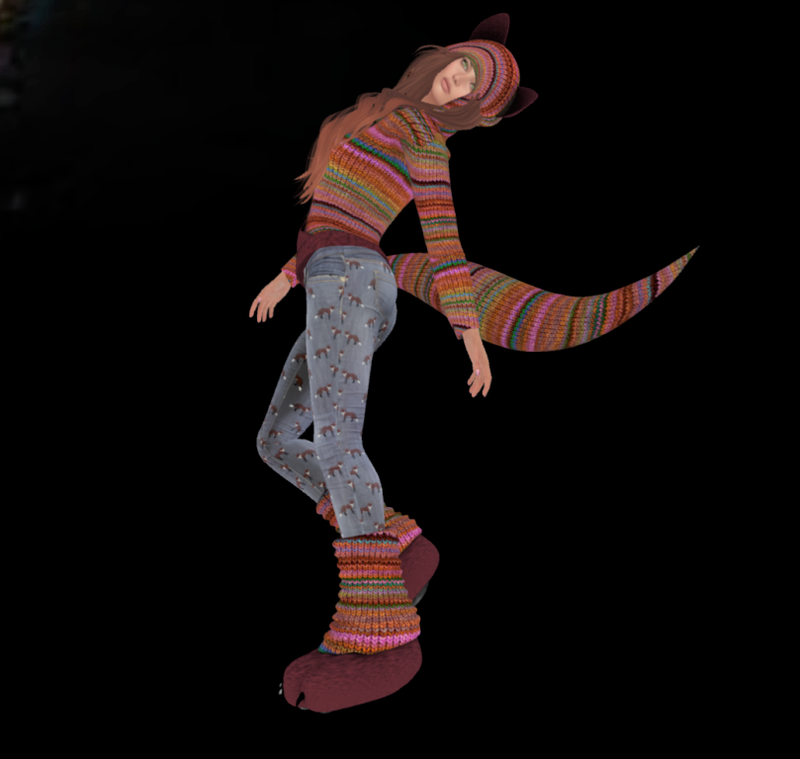 I want to highlight the Shii Geta and Stockings from +Aii+ These are available @ the Kawaii Event and come with a hud with 4 white stocking textures, 4 black stocking textures, 4 sole textures and 4 pearls. These work wonderfully with a sideless dress like the gacha goodies I'm wearing or with bodysuits. 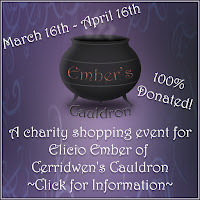 Ember's Cauldron Ongoing ~ a multi-store event to help raise funds for Elicio Ember, of Cerridwen's Cauldron. 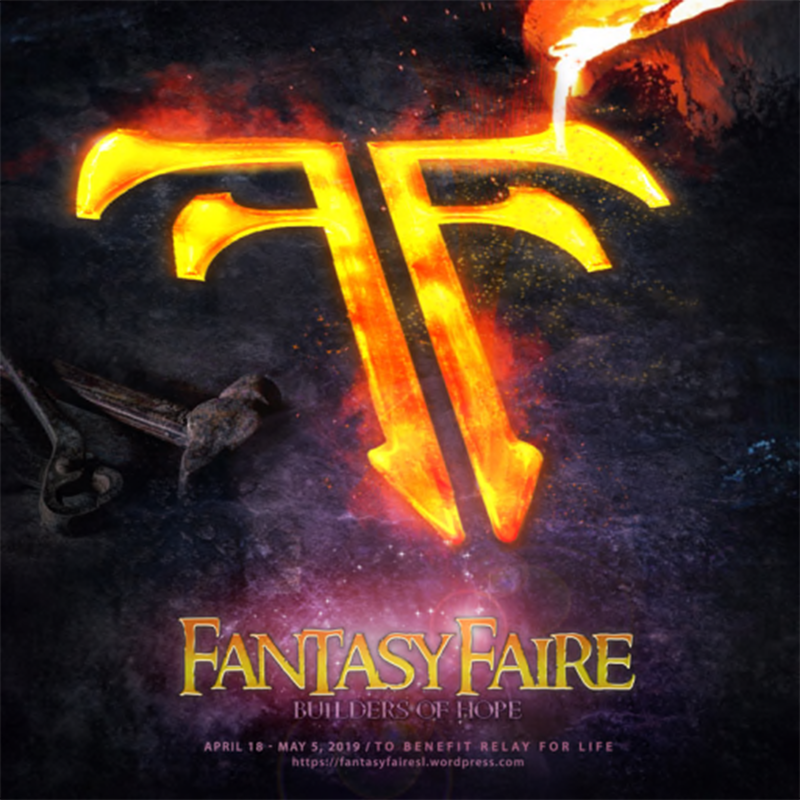 His father has been ill and the family needs all the help they can get, so many of the Fantasy Faire designers have put out donation cauldrons and special sales items to aid in that effort. Pick up a hud to be easily teleported to participating locations. Lootbox Magical Gacha Event - featuring gachas of a spring or fantasy nature. This one is little different in that it's possible to win Lootboxes, which contain several items from the gacha including some rares. I managed to get 3 Lootboxes without actually going broke, so they are fairly easy to win. 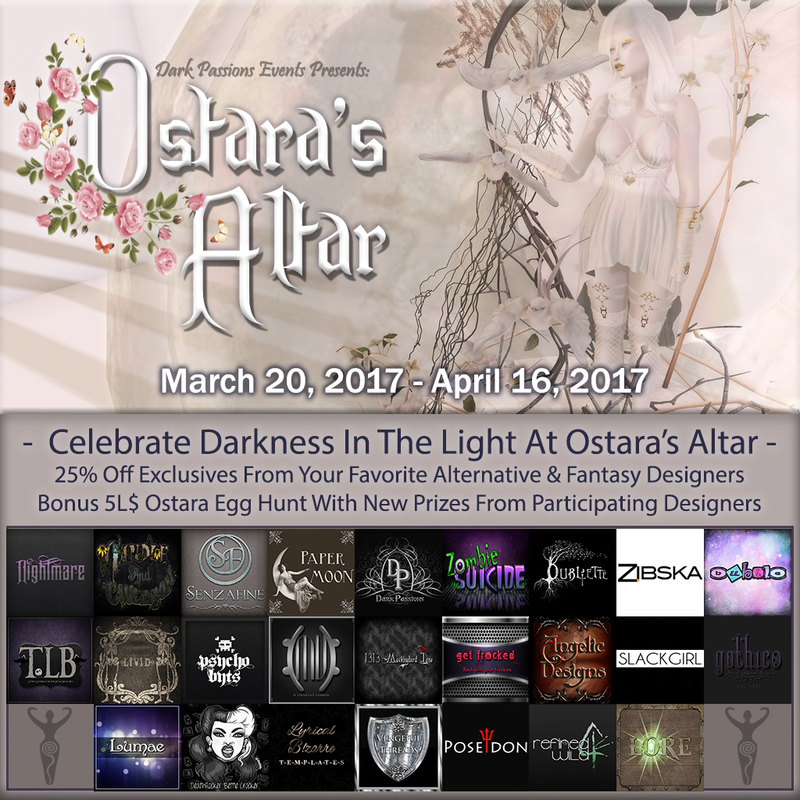 Ostara's Altar March 20 - April 16 ~ A shopping event for those who follow the Olde ways, the dark path, or Gothic lifestyle, though there are plenty of pretty pastels available. Click here to go to my dark blog to learn more. 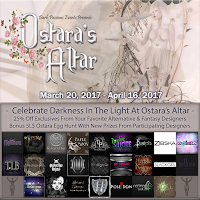 The Secret Affair March 15 - 31~ Another fun part sales / part gacha event with fantasy items. 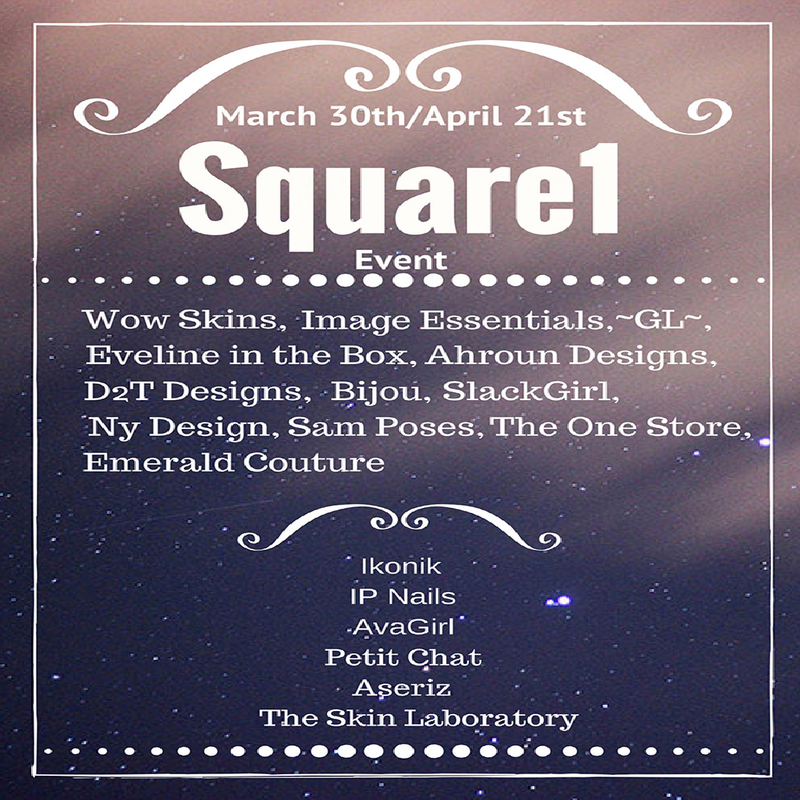 Skin fair Ends Sunday ~ Last weekend for this big event. If you've been saving up for that special skin or head, you'd better get over there! 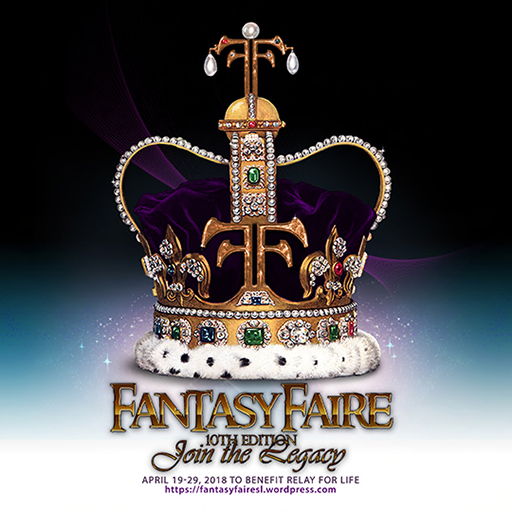 The fantasy artists and designers who will be bringing you Fantasy Faire at the end of April are working together to support one of their own. Elicio Ember of Cerridwen's Cauldron is struggling because of his father's illness and the Fantasy Faire family has pulled together to raise money to help them. Look for Ember's Cauldrons in your favorite fantasy shops. Donations can be made directly to the cauldron or by purchasing the special items associated with them like the ones in these pictures. Looking like it stepped from the pages of a storybook, the Almathea Dress by Ladies' Pleasure is available in 8 rich jewel tones, each with heavy gold embroidery on the skirt and sleeves and a jewel trimmed neckline. Shown in Emerald and Ruby. The gowns are available in special donation kiosks at the store. I'm wearing the Kodiak Kenai skin in Tone 1 just as it came from the box and completed the look with the Vaeri Headchain in gold from Lumae. Combine a fun laced romper from Le Fashion Whore with some poofy nails from DaneMarkZ and gacha boots from Blueberry and what do you have? A fun casual set. If you need something a little dressier, add that cute skirt that's been languishing in your inventory and your look can transition into a club outfit. The rompers come in 12 colors with a smooth and a denim version of each color. You get both versions of each color or you can buy a fat pack with all of them. The colors are bright as Easter eggs and the romper fits and moves well. For L$101 each, you really can't go wrong. The DanemarkZ nails have subtle dandelion fluff on pastel backgrounds. They come with the usual 10 colors of nail awesomeness for Maitreya or Omega. Jewelry ~ Night Owl Designs Bangles! Another wonderful offering from the Ember's Cauldron group. 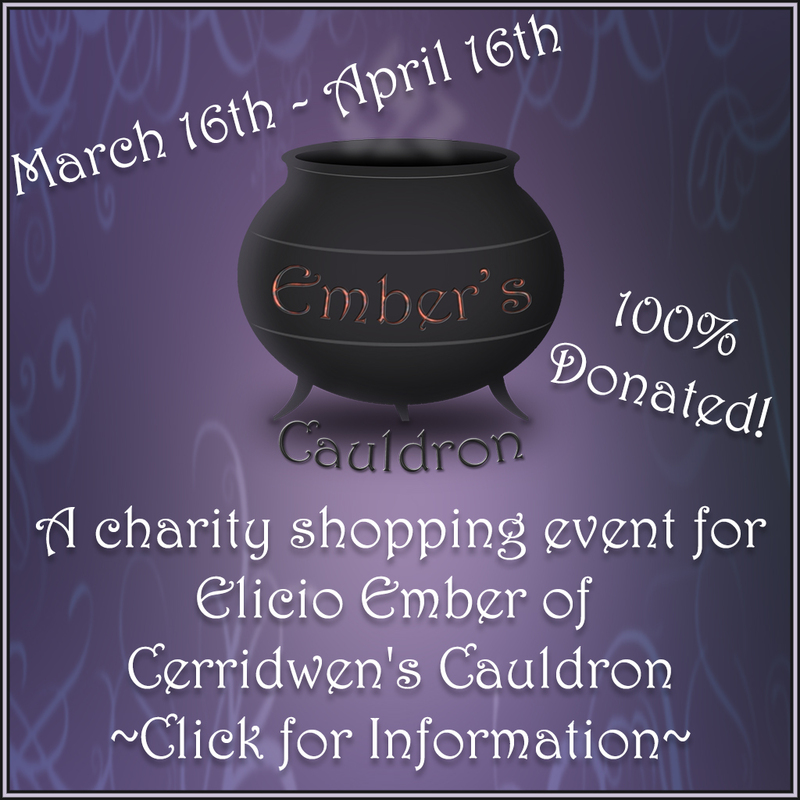 The artists associated with Ember's Cauldron have banded together to raise funds for Elicio Ember, of Cerridwen's Cauldron, whose father is ill and who needs all the support we can give them. Look for donation cauldrons and special items to purchase in your favorite fantasy shops and pick up a free Ember's Cauldron hud which will quickly teleport you to all the participating shops. The Glowing Life mer set from Tir Na Nog comes with everything shown here except for the hair and necklace. The fins sweep gracefully and look like flowing rainbows as they move. It comes in a male edition as well, for all those mermen out there. The necklace comes from Touryuumon. It has a built in glow and the dragon seems to undulate. I have blogged some really cute outfits, but I have to say that this one is unequivocally the cutest look I have ever done for a blog. The Munchkin avatar is a ND/MD SE available now @ Skin Fair and the outfit is offered as part of the Ember's Cauldron fund raiser for Elicio Ember, of Cerridwen's Cauldron, whose father has had medical problems. You can help by donating to the cauldrons in selected shops and by buying special items like the ones pictured here. Pick up a Shopping Hud at any of the stores to be taken swiftly to the other participating locations. ND/MD is the home of unique avatars and wonderful skins and has been one of my favorite stores for a long time. 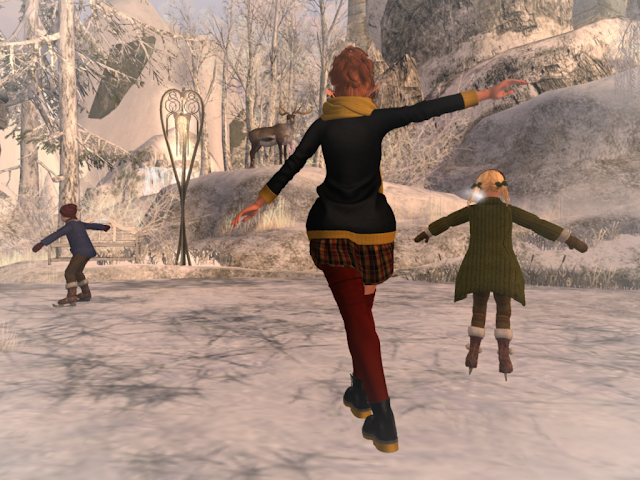 The Cuties are unique in SL. The mesh avatar comes complete with huds that give you the choice of looking ages 12 months - 3 years , male or female and offers a variety of skintones, eye colors, and alpha masks to make these extremely easy to use. Cutie outfits and accessories are available at the store. While there, join the group for free goodies and latest news. The Ember's Cauldron dress is called Charly and comes with 6 pastel background colors in a hud and also with an additional collar style in case Gramma comes over and worries that you might not be warm enough. The sandals are the cutest things I've seen in ages and come with an internal color change hud to match the dress. The dress will fit Toodledoo bodies and includes a special shape to use with your Cutie. Simply Shelby makes wonderful mesh items for the home and garden. The Ember's Cauldron offering, Fairy Blooms Garden, is a stone sided rectangular planter box full of spring flowers and butterflies. The default size is 8 li and it can be resized, as I have done for these pictures, without any texture distortion. At 20 li size, it's big enough to fill the space in front of my little cottage. help one of their own. You can donate directly to the cauldrons or purchase special items with proceeds going to the charity fund. Pick up a Shopping Hud at any of the stores to be taken swiftly to the other participating locations. See my Dark Blog for details and SLURLS. Fusion 101 This month's offerings are cute, colorful and comfortable. There are some free group gifts including this cute dress, Marisol 24 KT from Ana Markova. Most items are L$101 or less, so a new spring look is not going to ruin your budget. The Purple Connection Fair I hope you like purple, because you're going to be seeing a lot of it in the next few months. Relay for Life, SL's favorite charity event, which raises donations for Cancer Research, uses purple as a unifying color. If you don't already have a wardrobe full of purples, visit the Purple Connection Fair. The event features 50L Specials, donation creations, gifts and many 50% discounted items, all in purple or trimmed with purple. Lots of gachas with all sorts of things in all sorts of colors, too. Skin Fair offers skins, shapes, makeup, tattoos, nails and just about anything else you need to make your avatar unique. The massive crowds of last weekend should have dissipated by now and you can actually get in and do some browsing. I'm wearing Catwa's Bento Exclusive head, Lona, and Belleza's Callie skin. Though many of the items will be available later in the designers' shops, Fair Exclusive items will only be available till March 26. Spring is peeking through in some places, but in others it's still snowy. I decided to take advantage of the skating pond one last time before the thaw. This sweater and skirt combo from Entice fits the bill for transitioning from the chill of winter to the warmth of spring and I love the practical boots and socks. I always have one sock that just won't stay up! The scarf is optional. There are color huds for everything so you can mix and match to your heart's content. Warning: if you are a shopaholic or a skin addict, do NOT go to Skin Fair! I was doing so well. I had wandered around looking, making notes, taking demos and had narrowed down a couple dozen possibilities to 4 items I really liked. I wore a nice outfit from Designer Showcase and looked like I meant business. I had no lag at the time I went. I went home and opened the demo boxes... nothing I couldn't live without... and then it happened! I tried the newest Catwa Bento head, Lona. It was nice, but I didn't have to have it... until I tried it with the Belleza Catwa Exclusive skin, Callie. I was Doomed! Skin Fair offers 85 skin, makeup, tattoo and accessory stores in a 2-sim block. My chosen head and skin were on opposite ends of the event, with the dreaded sim crossing going across between them. When I tried to return to purchase them I couldn't tp in. The event had officially opened and was packed! When I finally did wiggle in, I bought my skin, but I couldn't cross the simline to get to the other section. [There's a joke there somewhere: Why did the shopper cross the simline?...] I could see people on the other side of the simline bouncing off as they tried to get to where I was. It would have worked out if we'd been able to just switch places, but that was not to be. I wanted to cry, but I prevailed. I got my head and my skin and I'm going home to collapse! You'll just have to wait to see my new look. I'd suggest you go do some nice shopping someplace like Designer Showcase and wait a few days to try and get into Skin Fair. Whether you like animals big or small, wild or tame or even just pretend, there's something for you at the Animal Stuff Sales event. My buddy Robbie from Robbie Roo's Whatchamagoos is offering the most adorable hoodies I've ever seen. Available in either Fox or Dragon style, these are like a comfy sweater that your loving granny knitted just for you. The Striped Fox version zips up and comes with foxy jeans. The Argyle Dragon version is open and is worn over a cute romper for the girls or shorts for the guys. Both styles come with matching tails and paws. Robbie's Stuff booth has a wonderful gift for you as well as the cute clothes. You can get a stufftie to match your hoody and he even includes a script you can insert in your knit friend so that you can use it as a tip jar. Designers work hard to create coordinates and looks that work perfectly together, but I'm the sort of rebel that likes to do my own thing. If you're a rebel, too, don't be locked into outfits as they come out of the box. The real fun is making a look that is uniquely yours. Use the pieces from different outfits together. The really well done ones will work together just like the separates in your RL wardrobe and you won't know what you might love until you try it. Play with your clothes a bit and try colors you wouldn't ordinarily wear. Be sure to try the DEMOs which most designers provide for just this purpose. The jeans are Brenna from I.M. Collection. These are available in 3 denim shades with silver or gold accents and the textures are wonderful! 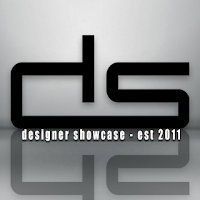 The clothing options here are available this month @ Designer Showcase. One thing that we can do in SL that's not so easy in RL, is to change our hair and eye color to coordinate with our outfits. This month Dulce Secrets offers eyes called Destiny for the Catwa heads. They're pretty with the right amount of shine and shadow to make them very realistic and are available in 3 collections.